The ‘Scandal’ star and mother of two shimmered in a sequined Prabal Gurung dress featuring a strapless neckline, gathered detail at the waist, and a cascading ruffle that you can buy for $2,395 at Moda Operandi. 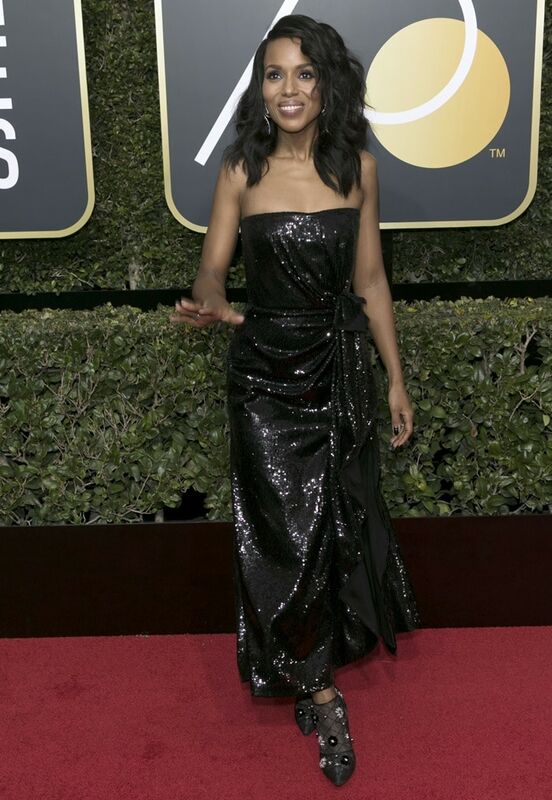 Kerry Washington accessorized with Lorraine Schwartz jewelry and completed the outfit with stunning ‘Net’ booties from Roger Vivier that you can purchase at Roger Vivier. The 34-year-old American actress, blogger, and former reality television personality turned heads in an Ermanno Scervino tulle high-low dress and accessorized with Chopard jewelry. Jamie Chung stole the shoe show with two different colored Sophia Webster ‘Rosalind’ shoes that you can purchase at Neiman Marcus and Net-A-Porter. For the after party, she changed into a strapless prom-style dress with layered skirt. Are you a fan of mismatched shoes? 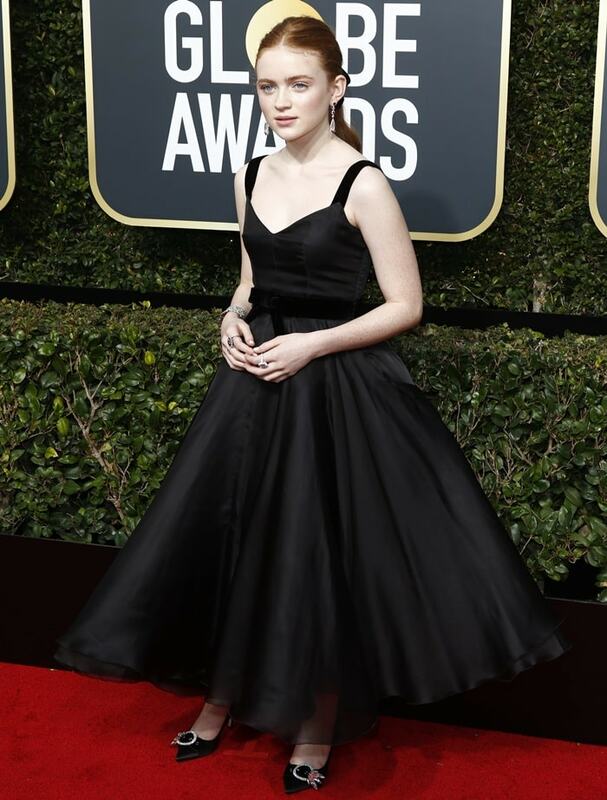 The 13-year-old English actress and model earned a solid 10 in her Calvin Klein by Appointment double-silk satin mini dress featuring billowing black sleeves and a ruffle motif that cascaded into a backless silhouette. Millie Bobby Brown accessorized with glittery Repossi jewelry that matched her mismatched Calvin Klein kitten heels. While she hid them quite well most of the evening, we finally got a shot of her sky-high Christian Louboutin heels at the InStyle and Warner Bros. Party. You can buy her ‘Louloudancing’ suede platform sandals at Barneys New York. 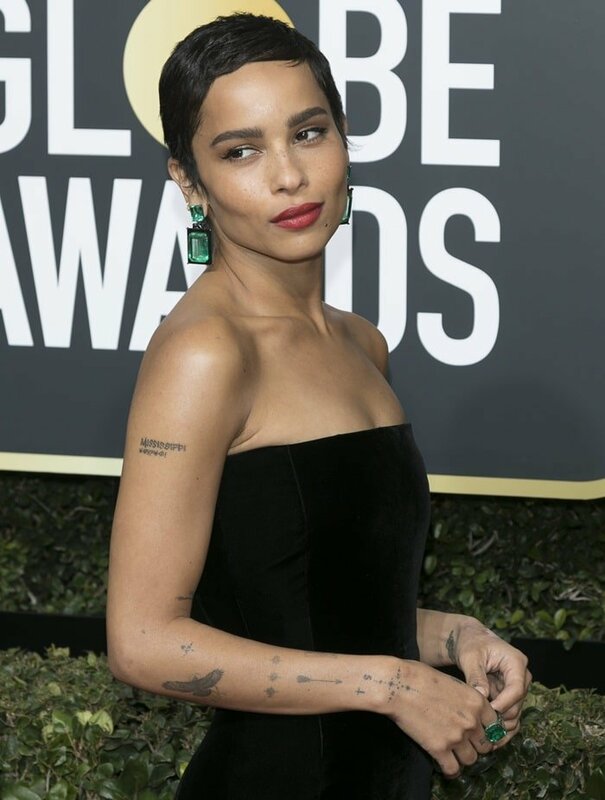 Zoë Kravitz styled them with a strapless Saint Laurent gown and oversized emerald earrings and a matching ring from Lorraine Schwartz. The pregnant supermodel put her growing baby bump on full display in a leopard-print halter gown from the Balmain Pre-Fall 2018 collection with cheeky keyhole detailing. Miranda Kerr accessorized with Niwaka jewelry, a Jimmy Choo clutch, and completed her outfit with Giuseppe Zanotti‘s black patent ‘Harmony’ leather sandals that you can purchase at Farfetch. Would you dare to wear high heels if heavily pregnant like Miranda Kerr? The 27-year-old actress sparkled in a long-sleeved black gown from Gucci featuring a plunging neckline, a crystal bow, and three-dimensional floral embroideries. Margot Robbie accessorized with Tiffany & Co. jewels and rounded off her outfit with silk satin ‘Sin Rv’ strass sandals from Roger Vivier’s Spring/Summer 2018 collection that you can buy at Roger Vivier. The 36-year-old actress went super chic in a one-shoulder jumpsuit from the Oscar de La Renta Resort 2018 collection consisting of a white top with black leaf design and black pants. Alexis Bledel accessorized with Forevermark jewelry, toted a clutch bag from Onna Ehrlich, and completed her ensemble with Jimmy Choo ‘Romy’ pointy-toe pumps that you can buy at Nordstrom. The 15-year-old ‘Stranger Things’ actress donned an age-appropriate ankle-length Miu Miu dress featuring a voluminous ball skirt. Sadie Sink styled the custom gown with an assortment of red, silver, and gold jewelry from Chopard. Do you think the sparkling jewels seemed a bit mature for her? 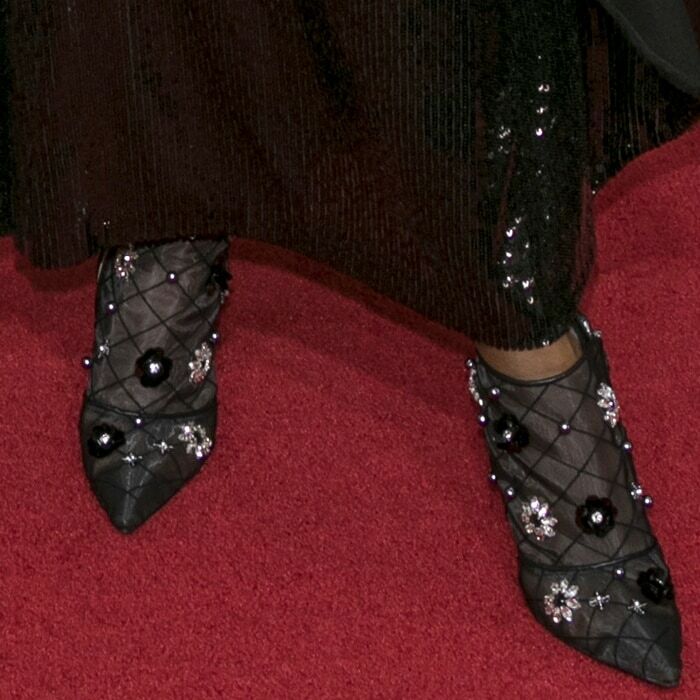 At least they matched her Miu Miu satin pointy-toe pumps with crystal buckle that you can buy for $890 at Bergdorf Goodman. 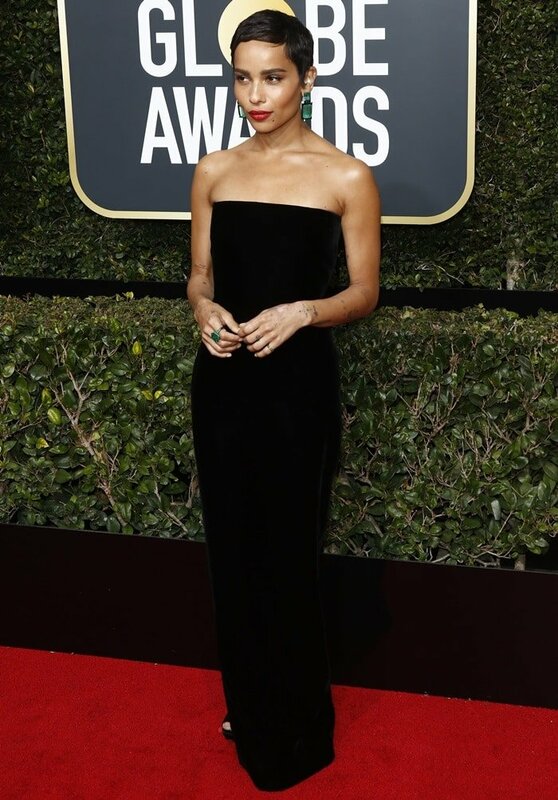 Halle Berry looked stunning in a black sheer dress on the red carpet at the 2018 Golden Globe Awards as she posed alongside fellow Oscar-winning actress Reese Witherspoon. The 51-year-old American actress switched things up with a sheer lacy black minidress from Zuhair Murad’s Spring 2018 collection that showed off her incredible figure. She finished her red carpet look off with Swarovski earrings, a Maxior ring, strappy Jimmy Choo sandals, and a black diamond and emerald ring by AS29. The 35-year-old American actress won the award for Best Performance by an Actress In A Television Series, Drama for her work on ‘The Handmaid’s Tale’ at the 2018 Golden Globes. 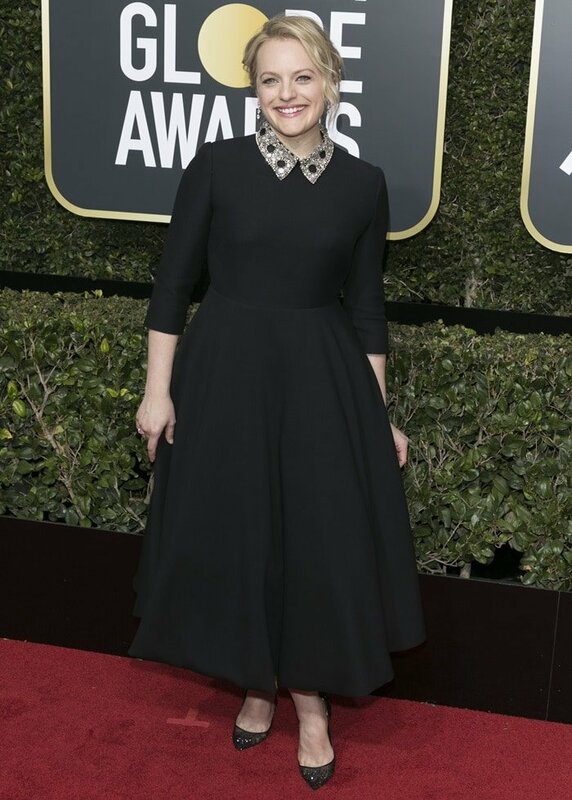 Elisabeth Singleton Moss hit the red carpet in a tea length Dior Haute Couture gown featuring a beautifully embellished collar. She accessorized with Forevermark jewels, a Roger Vivier clutch, and glittering Christian Louboutin pointy-toe lace pumps.